In Fog Warning with Barnacles, Valerie Hegarty continues to reconfigure the paradigms of American painting through interventions that appear to be the result of natural events. 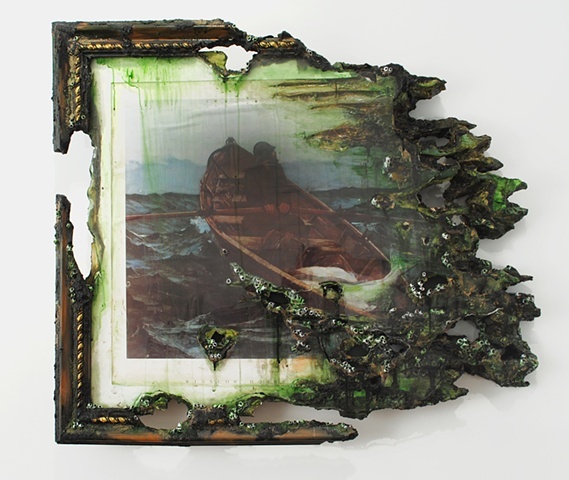 Referencing Winslow Homer's 1885 painting, The Fog Warning, Hegarty's careful construction creates the illusion of a painting that has been ravaged and weather-beaten by the turbulent sea depicted in the original subject matter. The sheer force of nature seems to assert its dominance over the artist's failed attempt to contain it. Manipulating perception through craft, Hegarty creates the façade of a relic shaped and transformed by nature's power.Hegarty's work functions in the space between sculpture and painting, referencing both but fully adhering to the standards of neither. "This particular piece uses the reproduction of "The Fog Warning". It is one of my all time favorite Homer's. (The image of the man at sea looking over his shoulder at the storm moving in. I think is very relevant to today's general anxiety, unsettling feelings of impending trouble on all levels, politically, socially, etc. can be interpreted more personally, like old age, sickness, etc. I don't have one particular way I think about it). My piece suggests the storm has caught up with the man in the boat, now the image itself has been the subject and victim of the storm. I like the idea of the Homer image being swept away in a Homeresque manner, engulfed by the ocean. Like a Borges or magical realist short story. I have a personal attachment to Homer having grown up in Northeast Massachusetts and Maine, with Homer reproductions hanging in the house, and drawn to the romantic imagery as a child."